You'll be £25.00 closer to your next £10.00 credit when you purchase Flying at the Edge. What's this? This is the autobiography of an outstanding fighter pilot during his twenty year career with the Royal Air Force. Tony Doyle first flew when in the CCF where he complted a glider course and then a highly-prized Flying Scholarship. This opened the way to joining the RAF and becoming an all-weather tactical fighter pilot flying de Havilland Vampires and Gloster Meteors. At this he excelled and was posted as a flying instructor and then Staff Instructor. This was the age when the Jet Provost was the standard training aircraft. During 1962 he was selected to fly with the newly formed Red Pelicans aerobatic display team and honed his skills as a display pilot. Tony moved to RAF Valley as the new Folland Gnat was being introduced in the training role. This diminutive aircraft was somewhat of a breakthrough and after ironing out several design problems it proved a superb aircraft, being fast and agile. The general public were eager to see this new RAF addition and Tony became its display pilot, flying at open days throughout the UK and Europe. In 1964 Tony converted to the English Electric Lightning, Britain’s one and only supersonic fighter, with a top speed in excess of Mach 2 and a ceiling of 50,000 feet. He was posted to Treble One Squadron at Wattisham in October 1964 as part of the Quick Reaction Alert force against potential Russian bomber attacks. Once again he became the Lightning’s chosen low-level display pilot and demonstrated it at the 1965 Paris Air Show. Shortly after this he was forced to eject over the North Cornish coast after an engine explosion cause the loss of elevator control. This fascinating account of front-line and display flying goes into considerable detail of the aerodynamic qualities of the types flown, their dangers and advantages. There are many life-threatening incidents and successes that will educate anyone who is interested in flying at the very edge. It is interesting how much of the text is devoted to criticism of Higher Authority, and how the opinions of those at the sharp end clashed with the headquarters' idea of what could be done with the staff and equipment available. It is well worth reading through the 390 pages of close text to get to the background of the many and varied tasks given to the fighter pilots in the post-war years. Flying some of the worlds finest aeroplanes, Mr Doyle has seen more than his fair share of ups and downs, tragedies and near-misses. 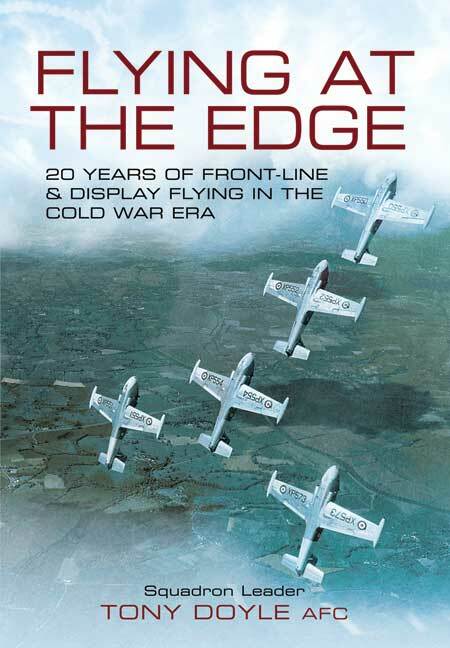 All are captured in a comprehensive, self-penned 200 page book, aptly titled 'Flying at the Edge'.